So we had a bunch of rain last week and due to The Cajun Village‘s location, and thus we were under water for a few days. Ascension Parish got anywhere from 10-15 inches of rain on Thursday, quite the inundation! We also have a hard time pumping water due to inefficient or ineffective pumps and gravity fed drainage, so the water stuck around for the last few days. I wrote about unique architectural ways that Cajuns, Creoles, and Louisianans dealt with the wet environment in Louisiana over the last 300 years a few weeks ago. 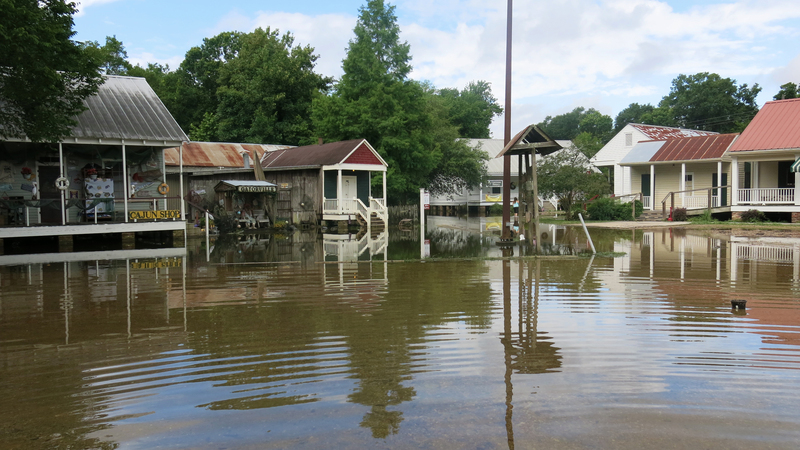 Luckily, the historic buildings in The Cajun Village were restored properly and were placed high enough on piers that none of our buildings flooded. Most of our buildings in the Village are supported by brick masonry piers. The beauty of the old brick piers is that they are unaffected by water. The mortar in between the bricks is permeable, allowing the piers to absorb water and breath. The masonry bricks, especially those of the older variety (prior the Philadelphia brick variety that was introduced to Louisiana in the mid- to late-1800s) were much softer than bricks we are used to today, with more pockets of air, were also able to absorb and release moisture just like the mortar. This combination of mortar and brick was and is perfect for when it floods. I am happy to report that all our buildings withstood the flooding with no damage at all. Yet another example of adapting construction and architectural design to the natural environment that saves the buildings!